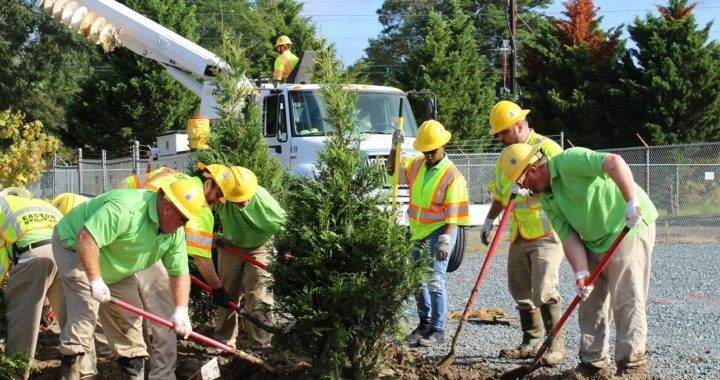 With a master plan in place and a strong, enthusiastic crew, Easton Utilities completed a noteworthy landscaping project for the future Easton Point Park. For aesthetics and to create a natural barrier, the landscaping features a variety of 45 trees and 53 shrubs. “This project aligns our mission and service to the Town of Easton with our proud tradition of environmental stewardship,” said Hugh E. Grunden, President and CEO for Easton Utilities. The entire staff of Easton Utilities, along with Town Councilwoman Megan Cook, planted trees, shoveled dirt and mud, and spread mulch on Wednesday, September 26, 2018. Easton Utilities Commissioner Bill Stagg, a recently retired Landscape Architect, created the design to run along the fence, which surrounds the substation. Mayor Willey’s proposal for the development of Easton Point Park features an open green space with a variety of park amenities along Easton’s only waterfront. The extension of Rails-to-Trails will weave through this space and across the new footbridge of the North Fork of the Tred Avon River. The tree planting initiative is a tradition at Easton Utilities since it first began in 2008. Every employee is required to participate in some capacity following the annual employee meeting. Following a safety briefing, the teams embark on their mission to plant and mulch the pre-selected location. This year they planted almost 100 different trees and shrubs to include a variety of crepe myrtles, junipers, arborvitae, white pines, viburnums and maples.